For other uses, see Joint Chiefs of Staff (disambiguation). Following the Goldwater–Nichols Act in 1986, the Joint Chiefs of Staff do not have operational command authority, either individually or collectively, as the chain of command goes from the President to the Secretary of Defense, and from the Secretary of Defense to the Commanders of the Combatant Commands. Goldwater–Nichols also created the office of Vice Chairman, and the Chairman is now designated as the principal military adviser to the Secretary of Defense, the Homeland Security Council, the National Security Council and the President. The Joint Staff (JS) is a headquarters staff in the Pentagon, composed of personnel from each of the five armed services, that assists the Chairman and the Vice Chairman in discharging their responsibilities and is managed by the Director of the Joint Staff (DJS), who is a lieutenant general or Navy vice admiral. After the 1986 reorganization of the military undertaken by the Goldwater–Nichols Act, the Joint Chiefs of Staff does not have operational command of U.S. military forces. Responsibility for conducting military operations goes from the President to the Secretary of Defense directly to the commanders of the Unified Combatant Commands and thus bypasses the Joint Chiefs of Staff completely. While serving as Chairman or Vice Chairman of the Joint Chiefs of Staff, Chief of Staff of the Army, Commandant of the Marine Corps, Chief of Naval Operations, Chief of Staff of the Air Force, or Commandant of the Coast Guard, the salary is $15,583.20 a month, regardless of cumulative years of service completed under section 205 of title 37, United States Code. Although the United States Coast Guard is an armed service (i.e. a branch of the military) pursuant to 14 United States Code, section 1, the Commandant of the Coast Guard is not a member of the Joint Chiefs of Staff because the Coast Guard operates under the Department of Homeland Security rather than the Department of Defense, and operates under the Department of the Navy (subordinate to the Chief of Naval Operations) when directed by the President. However, the commandant is considered a de facto JCS member for certain purposes and, by statute, is entitled to the same supplemental pay as the Joint Chiefs and is accorded the same privilege of the floor under Senate Rule XXIII(1) during Presidential addresses. The commandant is occasionally invited by the chairman to attend meetings of the Joint Chiefs of Staff. Also, in contrast to the Joint Chiefs, who are not in the military's operational chain of command, the commandant is in operational command of his service. Yet, the Joint Board accomplished little as its charter gave it no authority to enforce its decisions. The Joint Board also lacked the ability to originate its own opinions and was thus limited to commenting only on the problems submitted to it by the Secretaries of War and Navy. As a result, the Joint Board had little to no impact on the manner in which the United States conducted World War I. 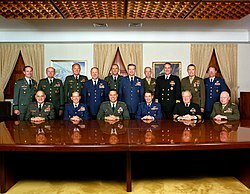 As a counterpart to the UK's Chiefs of Staff Committee in the CCS, and to provide better coordinated effort and coordinated staff work for America's military effort, Admiral William D. Leahy proposed a "unified high command" in what would come to be called the Joint Chiefs of Staff. Modeled on the British Chiefs of Staff Committee, the JCS' first formal meeting was held on 9 February 1942, to coordinate U.S. military operations between War and Navy Departments. The official history of the Army Air Forces noted that although there was "no official charter establishing this committee...by the end of February it had assumed responsibilities toward the American war effort comparable to the CCS on the combined level." On 20 July 1942, Admiral Leahy became the Chief of Staff to the Commander in Chief of the Army and Navy ("Commander in Chief of the Army and Navy of the United States" is the military title of the U.S. President, per Article II, § 2, of the Constitution), with the chiefs of staff of the services serving under his leadership. As the table indicates, each of the members of the original Joint Chiefs was a four-star flag or general officer in his respective service branch. By the end of the war, however, each had been promoted: Leahy and King to Fleet Admiral; Marshall and Arnold to General of the Army. Arnold was later appointed to the grade of General of the Air Force. One of the Joint Chiefs of Staff's committees was the Joint Strategic Survey Committee (JSSC). The JSSC was an extraordinary JCS committee that existed from 1942 until 1947. It was "one of the most influential planning agencies in the wartime armed forces." Members included Lieutenant General Stanley D. Embick, U.S. Army, chairman, 1942–1946, Vice Admiral Russell Willson, U.S. Navy, 1942–1945, Vice Admiral Theodore Stark Wilkinson, U.S. Navy, 1946, and Major General Muir S. Fairchild, U.S. Army Air Force, 1942–?. The position of vice chairman was created by the Goldwater–Nichols Act of 1986 to complement the CJCS, as well as to delegate some of the chairman's responsibilities, particularly resource allocation through the Joint Requirements Oversight Council (JROC). General Colin L. Powell (1989–1993) was the first and, as of 2011, the only African American to serve on the Joint Chiefs of Staff. General Peter Pace (Vice Chairman 2001–2005; Chairman, 2005–2007) was the first Marine to serve in either position. No woman has ever served on the Joint Chiefs of Staff. The Chairman of the Joint Chiefs of Staff is, by law, the highest-ranking military officer of the United States Armed Forces, and the principal military adviser to the President of the United States. He leads the meetings and coordinates the efforts of the Joint Chiefs of Staff, comprising the chairman, the Vice Chairman of the Joint Chiefs of Staff, the Chief of Staff of the United States Army, the Commandant of the United States Marine Corps, the Chief of Naval Operations, the Chief of Staff of the United States Air Force, and the Chief of the National Guard Bureau. The Joint Chiefs of Staff have offices in The Pentagon. The chairman outranks all respective heads of each service branch, but does not have command authority over them, their service branches or the Unified Combatant Commands. All combatant commanders receive operational orders directly from the Secretary of Defense. The position of Vice Chairman of the Joint Chiefs of Staff was created by the Goldwater-Nichols Act of 1986. The vice chairman is a four-star-general or admiral and, by law, is the second highest-ranking member of the U.S. Armed Forces (after the Chairman of the Joint Chiefs of Staff). In the absence of the chairman, the vice chairman presides over the meetings of the Joint Chiefs of Staff. He may also perform such duties as the chairman may prescribe. It was not until the National Defense Authorization Act in 1992 that the position was made a full voting member of the JCS. The current vice chairman is General Paul J. Selva, USAF. The Senior Enlisted Advisor to the Chairman of the Joint Chiefs of Staff (SEAC) advises on all matters concerning joint and combined total force integration, utilization, development, and helps develop noncommissioned officers related joint professional education, enhance utilization of senior NCOs on joint battle staffs, and support the chairman's responsibilities as directed. Command Sergeant Major William Gainey, USA, was the first SEAC, serving from October 1, 2005. The current SEAC is Command Sergeant Major John W. Troxell, US Army, who was sworn in by Joint Chiefs Chairman General Joseph Dunford on December 11, 2015, replacing Sergeant Major Bryan B. Battaglia, USMC. The Joint Staff (JS) is a military headquarters staff based at the Pentagon, (with offices in Hampton Roads VA, Ft Leavenworth KS, Lackland AFB TX, Ft Belvoir VA, Fairchild AFB WA, Ft McNair DC) composed of personnel from all the five armed services, assisting the Chairman and the Vice Chairman in discharging their responsibilities. They work closely with the Office of the Secretary of Defense (OSD), the Military Department staffs, and the Combatant Command Staffs. The Chairman of the Joint Chiefs of Staff is assisted by the Director of the Joint Staff, a three-star officer who assists the chairman with the management of the Joint Staff, an organization composed of approximately equal numbers of officers contributed by the Army, the Navy and Marine Corps, the Air Force, and the Coast Guard, who have been assigned to assist the chairman in providing to the Secretary of Defense unified strategic direction, operation, and integration of the combatant land, naval, and air forces. The J-6 directorate is one of a group of agencies that administer the SIPRNet. Other administrators include: the National Security Agency, the Defense Intelligence Agency, and the Defense Information Systems Agency. The J-6 chairs the DOD's Military Communications-Electronic Board, which works in conjunction with the multinational Combined Communications Electronic Board. The J-7 is responsible for the six functions of joint force development: Doctrine, Education, Concept Development & Experimentation, Training, Exercises and Lessons Learned. The Joint Chiefs may recognize private citizens, organizations or career civilian government employees for significant achievements provided to the joint community with one of the following decorations/awards. Although the Commandant of the Coast Guard is not an ex officio member of the JCS like the other service chiefs, Coast Guard officers are legally eligible to be appointed as Chairman and Vice Chairman, pursuant to 10 U.S.C. § 152(a)(1) and 10 U.S.C. § 154(a)(1) respectively, which use the collective term "armed forces" rather than listing the eligible services. However no Coast Guard officer has been appointed to either position as of 2016. The Coast Guard does have one officer who was appointed in 2016 to the Joint Staff who currently serves as J6. ^ a b "Top Guard officer joins Joint Chiefs of Staff". Army Times. 4 January 2012. ^ "2017 Military Pay Scale". Military Factory. May 2017. ^ a b Millett, Allan R. (1980). Semper Fidelis: The History of the United States Marine Corps. New York: Macmillan. p. 269 [para. 2]. ISBN 0-02-921590-0. ^ a b "Origin of Joint Concepts". Joint Chiefs of Staff. Retrieved 5 August 2018. ^ Bradley, John H.; Griess, Thomas E.; Dice, Jack W. (2002). The Second World War: Asia and the Pacific. United States Military Academy, Dept. of History. Square One. p. 26. ISBN 0-7570-0162-9. ^ a b Cline, Ray S. (1990). United States Army in World War II – The War Department – Washington Command Post: The Operations Division; Chapter VI. Organizing The High Command For World War II "Development of the Joint and Combined Chiefs of Staff System". Center of Military History, United States Army, Washington, D. C. pp. 98–104. Retrieved 5 January 2012. ^ Leighton, Richard M.; Robert W Coakley (1995). United States Army in World War II – The War Department – Global Logistics and Strategy 1940–1943. Center of Military History, United States Army, Washington, D. C. p. 144. Retrieved 5 January 2012. ^ Craven, James (1948). United States Army Air Forces in World War II – Volume I Plans and Early Operations Jan 1939 – Aug 1941; Chapter 7. Establishment of the Fundamental Bases of Strategy (PDF). AFHRA, Maxwell AFB, Alabama. p. 254. Retrieved 15 October 2016. ^ Stoler, Mark A. (1982). "From Continentalism to Globalism: General Stanley D. Embick, the Joint Strategic Survey Committee, and the Military View of American National Policy during the Second World War". Diplomatic History. 6 (3): 303–320 [quote at p. 307]. doi:10.1111/j.1467-7709.1982.tb00378.x. ^ a b  10 USC 152(c). Chairman: appointment; grade and rank – Grade and Rank. ^ "J6 Page at jcs.mil". Archived from the original on 14 May 2011. ^ Gibson, Tim (2003). "SIPRNET connectivity: do's and don'ts". Army Communicator. Archived from the original on 17 October 2015. Gillespie, Robert M. The Joint Chiefs of Staff and the Escalation of the Vietnam Conflict, 1964–1965. Masters Thesis, Clemson University, 1994. OCLC 32515894. Joint Chiefs of Staff. 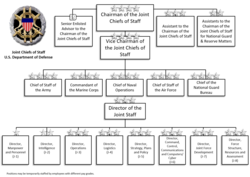 Organizational Development of the Joint Chiefs of Staff, 1942–1987. Joint Secretariat, Joint Chiefs of Staff, 1988. McMaster, H. R. Dereliction of Duty: Lyndon Johnson, Robert McNamara, the Joint Chiefs of Staff, and the Lies That Led to Vietnam. New York: Harper Collins, 1997. Perry, Mark. Four Stars: The Inside Story of the Forty-Year Battle Between the Joint Chiefs of Staff and America's Civilian Leaders. New York: Houghton Mifflin, 1989, ISBN 0-395-42923-4. Schnabel, James F. History of the Joint Chiefs of Staff: The Joint Chiefs of Staff and National Policy 1945–1947. Volume I. Washington, D.C.: Joint History Office, The Joint Staff, 1996. 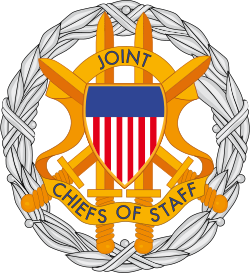 Wikimedia Commons has media related to Joint Chiefs of Staff.